After a few days of warm sunny skies, of summer weather taking place during summer days, I had become somewhat spoiled by the possibility of bare legs in August. On one of those downright balmy days, I let my legs take me to the Farmer’s Market on a Tuesday. Unthinkable! And yet, that day’s lunch break had one goal in mind. 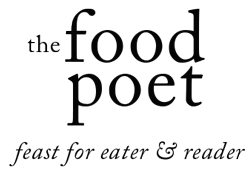 I spotted them almost gleaming from their big brown box and began the dance of picking them up, one by one, squeezing them between my fingertips and looking for the right give in this conversation of flesh and fingers. Stashed in a big bag, my treasure swung by my side, three pounds heavy and full of promise that while summer may not linger much longer, it would return as surely as the sweetness of September tomatoes taste of the summer sun relishing them with the urge to grow. Talk about one delicious way to use your homemade labneh kefir cheese, the colors and flavors of the salad dress up any table with their simple elegance. 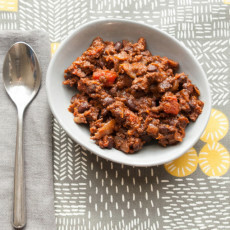 Like most dressed foods, you might find it tastes better with time and I find makes a great leftover for the next day. 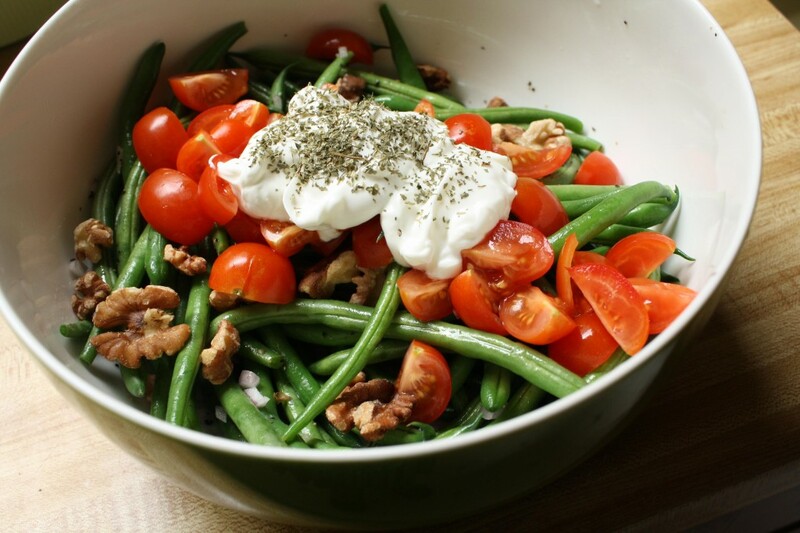 The addition of labneh lends a creaminess that once your fork has its way, blends with the dressing and coats the tomatoes, walnuts and green beans. It gets a little messy in appearance, but that’s part of the charm. Snap the ends off the green beans. Bring a pot of water to boil. Add green beans to boiling water and steam them for 2 minutes until bright green. Drain in colander. Chop the walnuts and then toast them for a few minutes until their aroma punctuates the air. Set aside. Mince the shallot. In a bowl, whisk together the lemon juice and walnut oil. Add in the shallot once the dressing is somewhat emulsified. Season with salt and pepper to taste. 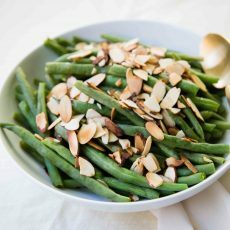 Tumble the green beans into a large bowl. Add the cherry tomatoes. Then drizzle the dressing over the beans and tomatoes and use tongs to disperse them in the dressing until coated. Add walnuts atop the green beans and tomatoes. Then add your dollops of labneh and finish with chervil sprinkled on the labneh. Beautifully said! 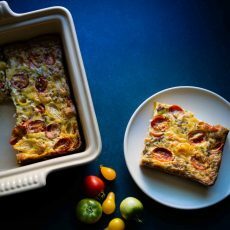 I’m coveting every last bite of summer, tomatoes especially. This salad is completely charming and I’m all for the mess of it.